Is your dad just the very best in the whole world? Tell him what you think, with the #1 Dad Ribbon. The #1 Dad is the perfect way to say that you think the world of your dad, and appreciate all that he does for you. These ribbons are perfect for Father's Day, but can also be given whenever you feel like letting your dad know that you care. 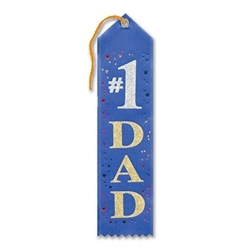 The #1 Dad Ribbon is made of blue material and says "#1 DAD" in silver and gold lettering. In the backdrop are metallic, multicolored confetti pieces. These ribbons are great, and so are the Number 1 Dad Award Button Ribbon and Red World's Best Dad Ribbon.